When it comes to food, Italy knows what it’s doing. So many of our favorite dishes stem from this food-centric country, including an all-time favorite dessert: tiramisu. Seriously, who doesn’t love coffee, chocolate, and sweet cream together? We certainly do. 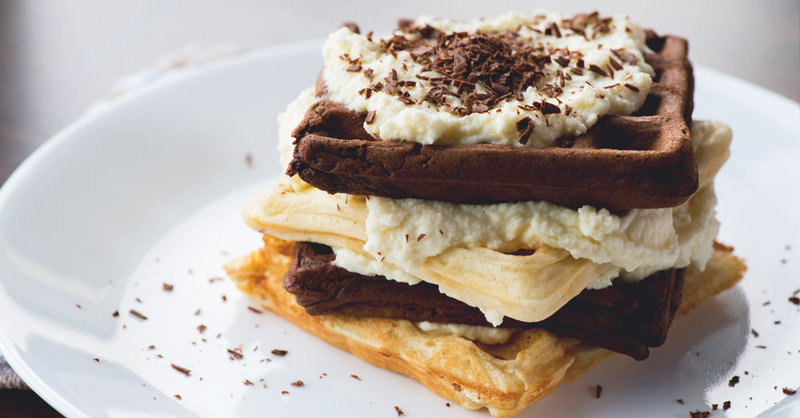 In an effort to enjoy these fabulous flavors more often, we got to playing around in the kitchen, and came up with perfectly decadent tiramisu waffles! We made both a coffee-chocolate batter, and a vanilla-rum batter, and layered tons of sweet, mascarpone-filled whipped cream between them. Now we can have a favorite dessert for breakfast…. And who doesn’t want that?! In a large bowl or mixer, beat mascarpone until light and fluffy, then pour in heavy cream and mix until stiff peaks form. Gradually beat in powdered sugar and vanilla extract, then place in refrigerator until ready to use. In a separate large bowl, mix together bisquick, milk, egg and vegetable oil until combined and smooth, then stir in 1 1/2 teaspoons vanilla extract. Pour 1/2 of batter into a separate bowl. To the original bowl, whisk in dark rum, if using, and to the new bowl, whisk in cocoa powder, cinnamon and coffee until combined. Preheat waffle iron and spray generously with nonstick spray. Optional: preheat oven to 200º F and place cooked waffles in oven to keep warm. Working in batches, pour in 1/3 cup vanilla (white) batter and cook for 3-5 minutes, or until golden brown. Remove and continue with remaining batter. Once vanilla batter is used up, cook chocolate batter, keeping cooked waffles warm in preheated oven. When ready to serve (you can stack waffles whole or cut them in half/quarters), stack waffles with generous dollops of mascarpone filling in between. Top with filling, then dust with your choice of powdered sugar, cocoa powder, or chocolate shavings. Enjoy!